Drama of a young man coming of age in a suburban Texas town during the 80s is a well written and acted story focusing on teen Ritchie Wheeler (Shiloh Fernandez ) who’s coping with becoming a man while his parents divorce and his world changes around him. High school is over and it’s time to decide what he wants to do with his life, but Ritchie would be perfectly happy to continuing working at the Skateland roller rink and hanging out with his friends. But times are changing and life has no intention of standing still even if Ritchie wants it to. Along with him are best friend Brent Burkham (Heath Freeman) and Brent’s beautiful sister Michelle (Ashley Greene), with whom he has feelings he’s also not ready to deal with. The movie smartly tackles the melodramatics and cliche’s usually associated with these type of flicks in a way that makes them feel fresh and keeps them quite effective. We’ve seen certain story elements before, but director Anthony Burns turns them back from cliche’s into life experiences we can all identify with by weaving them into the story and not presenting them as set pieces as many films like this do. The film really captures that moment in time between the end of high school and the beginning of the rest of your life, the one you wish could last forever, but life moves you forward whether you like it or not, as Ritchie finds out. And as Ritchie, lead Fernandez shows some really nice acting chops here and that he has a lot of potential with a subtle but emotion filled performance. Leading lady Ashley Greene shows far more range than her supporting part in the Twilight films allows and proves with a good script and director she is more than just a pretty face. Heath Freeman is also a hoot as the rambunctious Brent, who dreams of being a famous dirt-bike racer and has to face that this dream may not come true. And Haley Ramm is impressive as Ritchie’s younger sister, Mary a headstrong and very mature teen trying to help keep her already fractured family from falling any further apart. The dynamic between Ritchie and little sister Mary is one of my favorite parts of the movie. Ramm and Fernandez are gold in their scenes together. The supporting cast of relative unknowns also give strong performances that help give the story it’s weight and sense of realism and come across as people and not characters. Add to all this, there is a great 80s soundtrack and that is one cliche’ that’s always welcome with these movies. 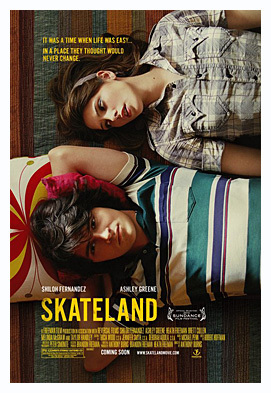 Having come of age in the 80s, I am a sucker for these kind of flicks and Skateland is one of the better ones I’ve seen in quite a while. I highly recommend it. Also stars James Le Gros as Brent and Michelle’s dad, Clive and Brett Cullin and Melinda McGraw as Ritchie’s mom and dad, David and Debbie Wheeler. A solid 3 and 1/2 Rubik’s Cubes! 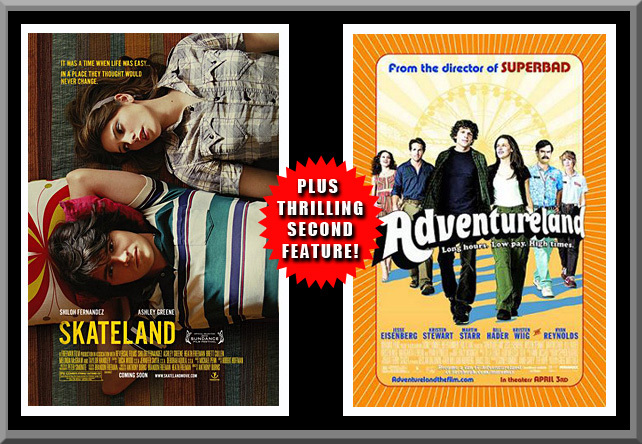 Adventureland tells the story of James (Jesse Eisenberg) a recent college grad whose plans to spend the summer in Europe and then go to New York to grad school to study journalism are dashed when his dad is demoted at work. To earn the money he needs to go to the Big Apple, James is forced to get a job at Adventureland, a third rate amusement park in Pittsburg. 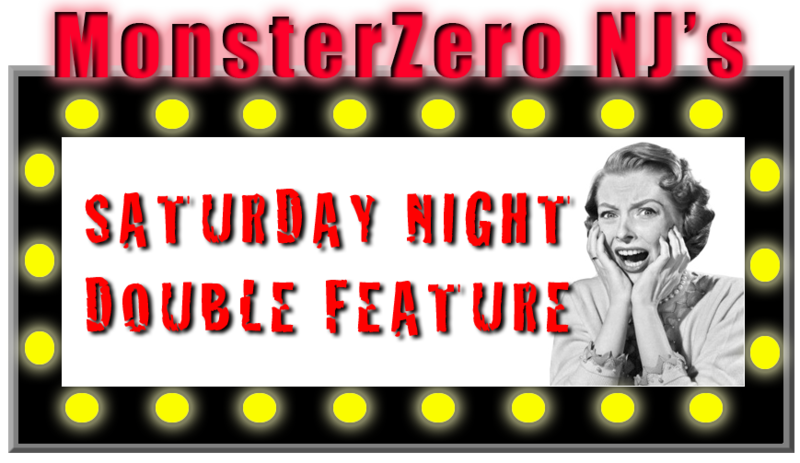 But there he meets an eccentric group of characters and the pretty Em (Kristen Stewart), a young girl with her own issues and dreams. As James struggles to figure out how to get his life back on track, the two bond finding solace from their perspective woes with each other. More drama than comedy, flick has grown on me a bit since first viewed, but overall, nothing we haven’t seen before. Yet despite it’s familiarity, it’s easy to identify with the story and it’s characters are somewhat endearing even though I wanted to throttle Frigo (Matt Bush). The cast give some very eclectic yet, down to earth performances. 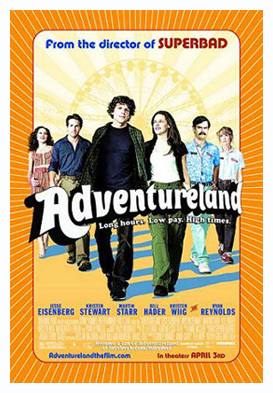 They seem exactly like the kind of people you’d expect to find working in a place like Adventureland and they grow on you as the film progresses. As for the leads, Stewart is not nearly as wooden as she was in Twilight, though still doing her disassociated thing. Eisenberg is fine, if not a little bland, as James, a young man who seems to be having a hard time accepting that life doesn’t always work out the way you want it to and that, occasionally, you have to take life’s lemons and figure out how to make lemonade. James needs to grow up and take control of his life. Sometimes you want to slap James out of his self pity, but that is part of his character and not the fault of the actor. Ryan Reynolds plays the park repairman, a musician wannabe named Mike Connell who is married yet likes to sample the park’s young female employees. He creates a guy whom you understand why people like, yet is obviously, in reality, a phony douche. Kristen Wiig and Bill Hader add some comic relief as the clueless husband/wife operators of the park and Martin Starr plays Joel, another intelligent college student who seems fine with wasting his life away as a pipe smoking slacker, but ironically, seems to support James’ not giving up on his dream. Superbad writer/director Greg Mottola gives us some nice moments and there are some fun bits too, but sometimes there is just too much melodrama for it’s own good. It does poignantly portray love at that period of time in life when you are just becoming an adult but still haven’t fully matured. That first relationship when you start to think a bit more seriously about the person you’re with, yet are still hesitant to give up your freedom to commit to something more meaningful. And it also nails the sense of having a dream and the frustration of not knowing how to reach it when things don’t work out as you planned. Add to that a great soundtrack of 80s tunes that really helps add a lot of atmosphere. So, things even out a bit when you add it all up and having graduated high school in the early 80s, this film is nonetheless nostalgic for me, so I cut it a bit of slack for some of it’s flaws. At the very least Mottola shows some versatility as this is quite different than his raunchy Superbad. ← NEW SET SHOTS FROM EXPENDABLES 3 FEATURE FORD AND SNIPES!